If you’ve been having difficulty finding time to buy a new vehicle in person, Legends Toyota is thrilled to bring the car dealership experience to you. Thanks to express online car-buying with our Toyota dealership in Kansas City, KS, there’s no need to step foot in our showroom if you’d rather complete the process online. Working late nights and early mornings? Busy bringing your kids to school and practice? You can finance a new Toyota from the comfort of your own home through this exclusive online car-buying perk. View our new Toyota inventory online to see which new car, truck, SUV or van you like most. You’ll love the interior features and safety technologies that come with the Toyota RAV4 and Toyota Highlander SUVs. Enjoy style at every turn in the driver’s seat of a new Toyota Camry or Toyota Corolla, or take the path less traveled in a new 4Runner. Plus, with new Toyota Tundra and Toyota Tacoma trucks for sale, along with Toyota Sienna minivans, you’ll have a wealth of new vehicle options at your disposal. Want to buy a new Toyota online? Just check out the steps below! Begin your Toyota leasing or buying search by selecting the Toyota model you’re most interested in. You’ll have the chance to upgrade Toyota trim levels and add any service contracts and protection packages you consider necessary. Are you looking to sell or trade in your car? You can trade in your vehicle and get its Kelley Blue Book Value® applied to your payment. Trade in and trade up to a new Toyota! Customize your Toyota financing plan to perfectly fit your budget and lifestyle. Sign the Toyota lease or loan that’s right for you. Once you’re ready, you can elect to pick up your new Toyota at our Kansas City Toyota dealer, or if you’d prefer, one of our Legends Toyota team members can drive your new Toyota to your driveway! Unsure of whether buying a new car online is right for you? 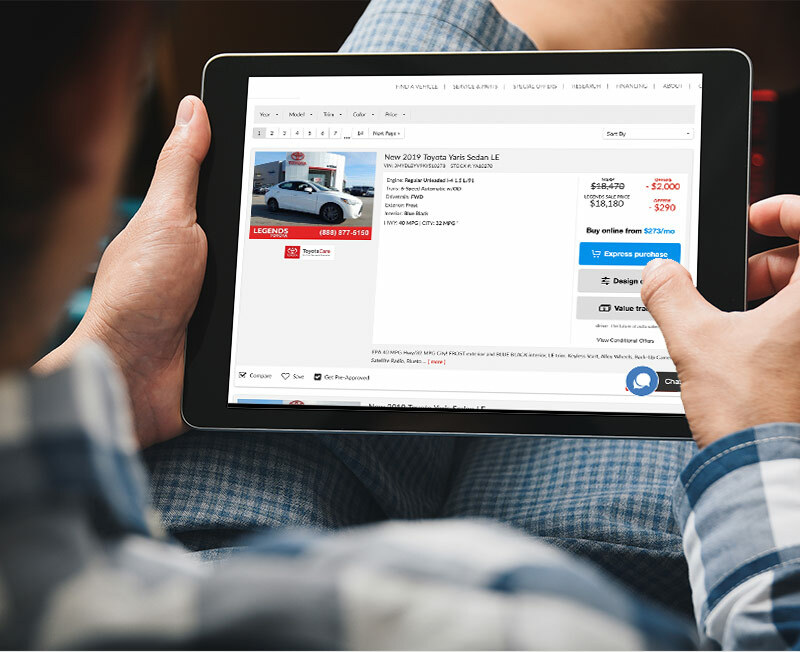 Contact Legends Toyota with any questions about the express online car-buying experience. Buy or lease a new Toyota RAV4 or Toyota Camry online now!